Climate Science: Roger Pielke Sr. | by Roger Pielke Sr. Comments Off on Roger Pielke Sr. is now on Twitter! I hope all of our readers have a great 2013, and I hope you enjoy reading the stats for 2012. You can follow our publications at our research website. Thanks for all your support over the years! The WordPress.com stats helper monkeys prepared a 2012 annual report for this blog. About 55,000 tourists visit Liechtenstein every year. This blog was viewed about 440,000 times in 2012. If it were Liechtenstein, it would take about 8 years for that many people to see it. Roger Pielke Sr.’ blog had more visits than a small country in Europe! After writing this weblog since July 2005, I have decided to retire it. It has been a very effective venue to present a wider range of viewpoints than were typically available elsewhere during the earlier period of my posts. In recent years, of course, a range of excellent weblogs that serve this purpose have appeared [e.g. see the long list of weblogs (cataloged by their different perspectives) at the right hand side of Watts Up with That. Most of them also permit Comments, which I stopped doing several years ago. I want to spend more of my time on research papers. The time I have been using to prepare the weblog posts can now be used effectively on peer-reviewed research papers. I also am completing the third edition of my modeling book, which will require significant time. The past weblog posts will remain on-line for the indefinite future. I very much appreciate all of the excellent input from the readers of my weblog! I plan to continue to publish and will be using that venue to present my views. With Best Wishes to All of You! Nuccitelli, Way, Painting, Church and Cook  comment on our Letter “Ocean heat content and Earth’s radiation imbalance. II. Relation to climate shifts” . Their criticism is unwarranted on at least three essential grounds. (1) It is based on a misunderstanding of the climate shift concept, which is central to our Letter; (2) in making its claim of incompleteness because of neglect of the deeper ocean heat content, it ignores our statement of possible error and introduces incompatible data; (3) it over-interprets our comments about CO2 forcing. We expand on these points. 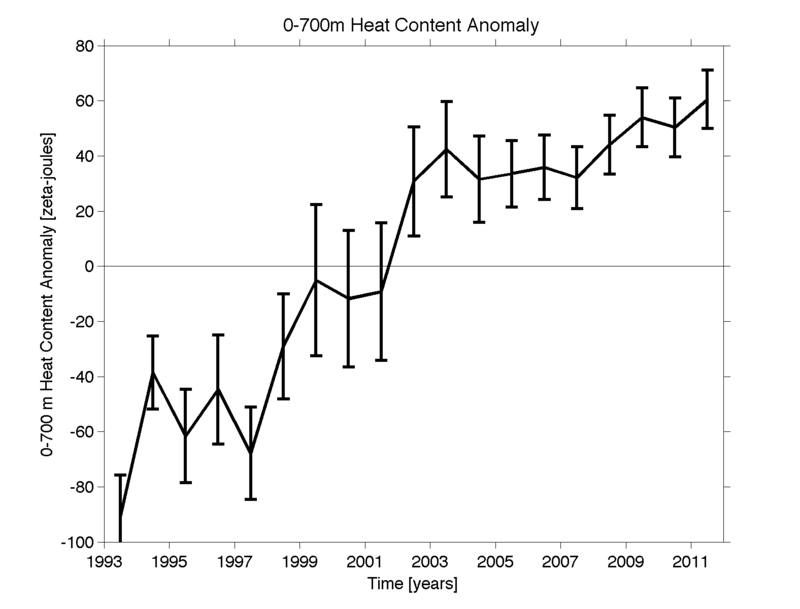 In sum, we show that the criticism of our results (change of slope in the implied FTOA at the climate shift of 2001–2002) by Nuccitelli et al. is unwarranted because they used different data of less temporal resolution. A more careful analysis of this data shows, in fact, consistency and not conflict with our results. 1. When you say “humans are significantly altering the global climate”, what do you mean by significant? More than nature? Just enough to be detectable? etc. Significant, as I intend it, means a clear detectable signal. For example, the increase of the atmospheric concentration CO2 at Mauna Loa resulting from fossil fuel activity is significant. Similarly, land use change has resulted in a clear signal of a change in the partitioning of the surface fluxes of heat and and moisture. Human input of aerosols have a well documented signal in the atmosphere and though surface deposition. These are examples of a significant alteration of the global (and regional and local) climate by humans. There, are of course, many other examples. 2. Do you consider cloud and moisture feedbacks to fall into the human category or the natural category? To the extent that feedbacks are different due to human climate forcings, this part of the feedback is, of course, human caused. However, I do not know how to separate feedbacks from observations, although, of course, you can in models. 3. What are the other important human-associated climate forcings besides CO2? For a short summary see my oral summary [https://pielkeclimatesci.files.wordpress.com/2009/09/pielke_oral_testimony.pdf] to a House Subcommittee. Pielke Sr., R.A., A. Pitman, D. Niyogi, R. Mahmood, C. McAlpine, F. Hossain, K. Goldewijk, U. Nair, R. Betts, S. Fall, M. Reichstein, P. Kabat, and N. de Noblet-Ducoudré, 2011: Land use/land cover changes and climate: Modeling analysis and observational evidence. WIREs Clim Change 2011, 2:828–850. doi: 10.1002/wcc.144. Jonathan Foley is the director of the Institute on the Environment (IonE) at the University of Minnesota, where he is a professor and McKnight Presidential Chair in the Department of Ecology, Evolution and Behavior. He also leads the IonE’s Global Landscapes Initiative. As a result of a committee I am on [which I will have more to say about at a later date], there remains the misunderstanding with respect to the role of human land management on the climate system. Jon Foley’s powerpoint presentation is among the very best at documenting the role of human land management as a first order climate system (and environmental) forcing. Agriculture is now a dominant force behind many environmental threats, including climate change, biodiversity loss and degradation of land and freshwater…. In fact, agriculture is a major force driving the environment beyond the ‘‘planetary boundaries’’ …. Clearly, climate assessments that focus primarily on CO2 and a few other greenhouse gases are inappropriately too narrow. James Wynn has published articles on rhetoric, mathematics, and science in Rhetorica, Written Communication, and 19th Century Prose. His recent interests have been in rhetoric, science, mathematics and public policy with a focus on nuclear power. 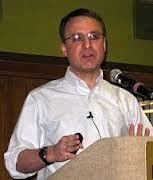 He is a founder and current director of the Pittsburgh Consortium for Rhetoric and Discourse Studies. I am an Associate Professor in the English Department at Carnegie Mellon University working on a book about citizen science. In my book I intend to include a chapter on the Surface Stations project. In the process of researching, I have been trying to get a sense about the development of the project and the peril and promise involved in citizen/scientist collaborations. I was wondering whether it might be possible for me to have a brief phone interview with you about your role in the project . I really appreciate your taking the time to read and consider my request. Here are my questions. I appreciate your taking the time to answer them. 1. To what extent and in what ways were you involved in developing the Surface Stations project? What persuaded you to get involved? Please provide some detail about your involvement and motivations. It took several years for this later paper to get through the review process since there was resistance to publish such a critique in the quality of station siting. This last paper is the first formal peer-reviewed paper resulting from the effective research collaboration with Anthony. 2. Were you involved in the writing or editing of Watts’s report Is the U.S. Surface Temperature Record Reliable? (2009)? If you were, please provide some detail about your contributions to the document. 3. To what degree, in your estimation, did Watt’s report offer an appropriate (fair/balanced) treatment of Surface Stations findings? What sorts of criticisms did it provoke in the scientific community? Please include only ones that might be considered reasonable. Anthony’s work has had a major impact on NCDC. Not only was he invited to present a lecture at NCDC, but his work has been used by NCDC both in at least one of their published papers, and in removing poorly sited locations from their sata set. Anthony involved expertise in the climate community, including John Neilson-Gammon at Texas A&M who is Texas State Climatologist. I recommend you ask Anthony about this, including how NCDC inappropriately, in our view, used Anthony’s data. In the BEST project, Richard Muller used Anthony’s siting data in this analysis. While I disagree with the conclusions claimed by Muller (he has grossly misinterpreted and overstated the BEST findings as I have documented in my weblog), the BEST use of Anthony’s data illustrates that the surface station project led by Anthony is a robust scientific endeavor. 4. What challenges/resistance did you face personally/professionally because of your collaboration with Watts? What has motivated you to work with skeptical members of the public despite these challenges? I disagree with the term “skeptics” as used in the climate discussion as I view it as pejorative. I work with colleagues of all perspectives. Anthony Watts clearly has established himself as a respect scientific colleague. 5. What role, in your opinion, should scientist play in engaging the public on issues of public controversy? To what extent do you believe your opinion is shared by other members/organizations in your field? 6. If there are challenges/barriers to scientists’ engagement with the public, what sort of solutions, in your opinion, would improve current practices? I recommend my son’s books which I have listed above. We discuss the adoption of a bottom-up, resource-based vulnerability approach in evaluating the effect of climate and other environmental and societal threats to societally critical resources. This vulnerability concept requires the determination of the major threats to local and regional water, food, energy, human health, and ecosystem function resources from extreme events including those from climate but also from other social and environmental issues. After these threats are identified for each resource, then the relative risks can be compared with other risks in order to adopt optimal preferred mitigation/adaptation strategies. This is a more inclusive way of assessing risks, including from climate variability and climate change, than using the outcome vulnerability approach adopted by the Intergovernmental Panel on Climate Change (IPCC). A contextual vulnerability assessment using the bottom-up, resource-based framework is a more inclusive approach for policy makers to adopt effective mitigation and adaptation methodologies to deal with the complexity of the spectrum of social and environmental extreme events that will occur in the coming decades as the range of threats are assessed, beyond just the focus on CO2 and a few other greenhouse gases as emphasized in the IPCC assessments. Thanks! I will plan to post later this week. See below for my follow up. You have my permission to publish my questions and your answers. The book will take some time to finish so you needn’t worry about interfering with that. I would also appreciate it if you could elaborate a bit on some of your answers to my questions. In question three I asked about the appropriateness of the Surface Stations findings in the report Is the U.S. Surface Temperature Record Reliable? (2009). I wanted to get your perspective on whether the fact that in this report Watts jumps from the data about the stations to conclusions about their effect on temperature bias (p.16) to policy recommendations (p. 17) was something you were comfortable/uncomfortable with and/or something that opened the report up to critique from other members of the climate science community. • An independently managed and comprehensive quality-control program should be implemented by NOAA/NWS to determine the best stations in the network. • A pristine dataset should be produced from the best stations and then compared to the remainder of the USHCN network to quantify the total magnitude of bias. • Users of the current USHCN data should be advised of the quality-control issues so that they may reexamine results derived from such data. I agree with each. NCDC has done a poor job of quality controlling their network (and this is also true for many countries around the world whose data is used to create the GHCN). If it was not for Anthony, we would not have had any movement on this issue from NCDC. Indeed, while I was State Climatologist for Colorado, we had a small contract to photograph USHCN sites in Colorado. We provided the photographs to NCDC (and, unfortunately did not retain copies). Later when we sought to obtain them we were refused. Anthony’s outstanding project leapfrogged over this bureaucratic roadblock. You mention that you disagree with the term “skeptics” to refer to Watts or other people who challenge climate change. What term would you prefer to use instead? Anthony Watts is as much a part of the climate science community as are those who wrote the IPCC reports. It is just that those who wrote those reports consciously decided to exclude viewpoints such as Anthony’s. You can see my letter as to why I resigned from participation in the IPCC process in 1995 (and was never asked again). In answer to my fifth and sixth questions, your response seems to be that scientists can engage with the public by working with them at the local-level to assess the socio-economic effects of climate forcing. In the context of your work with Watts, however, there seems to be a broader national scope and the issue being addressed is the credibility of the science at the base of an important socio-political issue. This is not to suggest that your mission was to challenge the credibility of the institutions doing the science but to bring awareness and fill in holes in the scientific knowledge about temperature biases. So what I want to know is whether there are a broader set of roles for scientists. Also, when you answer about the challenges to working with the public your answer seems to explain the challenge of solving the problem of climate change rather than the challenges generally of working with the public. I am very much interested in the latter. I endorse the policy approach recommended in my son’s book The Climate Fix. Anthony’s work on the surface temperature data is an excellent example of applying the scientific method to a particular climate metric which is being used for policy applications. His website Watts Up With That provides an effective venue for individuals from all perspectives to constructively discuss climate science more broadly and policy actions that are needed to deal with threats from climate and other environmental risks. This risks involve local, regional and global issues. Finally, I wanted you to know that I have conducted a phone interview with Anthony about the project.